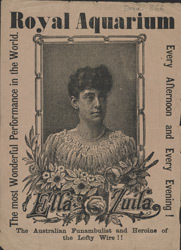 'Ella Zuila' was the stage name of the most famous Australian public entertainer of the 1880s. Billed as a ‘Funambulist’, she performed death-defying acrobatic feats, entertaining audiences all over the world. Her act included carrying children across tightropes - sometimes blindfolded - and lifting men long distances on her back. Her career was ended by a terrible injury incurred riding a bicycle across a highwire in Dublin. Ella's real name has been lost to history.